I struggled with this exercise from my Creativity, Innovation and Change course. I could see the individual pieces and how they work. I could see the whole. I just couldn't see how to put them together and relate it back to my experience with this course. I've spent all week thinking about this and started to stress about not meeting the deadline (today is Thursday) (fear of failure) I couldn't come up with anything. I had no ideas no visions in my head so IFF wasn't even working for me. But I kept trying to come up with something (tenacity). So, today, I went looking through the forums and came across a post which led me to this: Outside the Pond. As soon as I saw the picture of the Wizard of Oz characters I had that flash and the whole thing synthesized in my head (ah ha moment). As I write this I'm still not sure exactly how it will look in the end ~ things tend to morph for me but I'm usually happy with my final results. 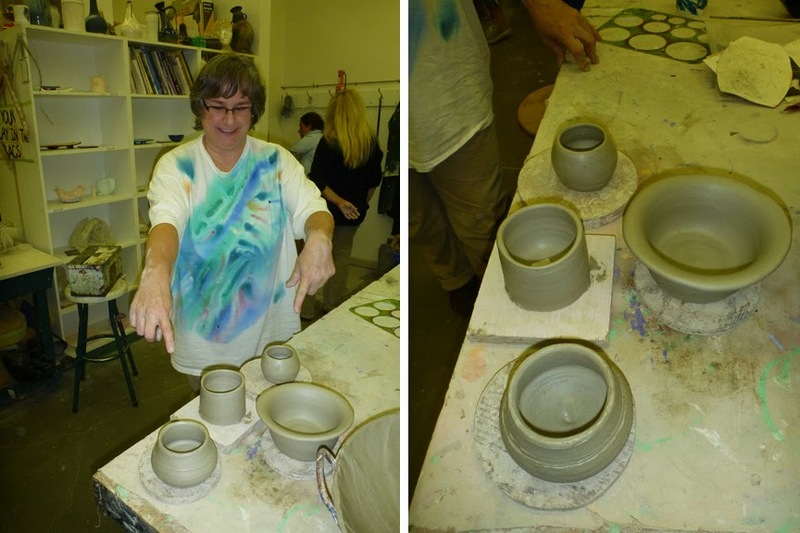 Last night I decided to forget about the exercise and went to my pottery class. The second night in a series of 8 classes. The first night I fiddled around with rolling out some clay, got myself acquainted with the clay and tools, leafed through books and tried to think of what I wanted to make (busyness). Anything to avoid the wheel! 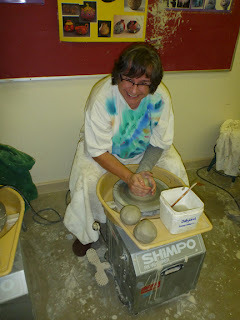 I have made things with clay before (hand-built) but had never tried the wheel. Before the class I was excited about trying it and could picture myself whipping off perfect pots every time. When it came time I got cold feet. The teacher made it look so easy and then the fear kicked in....what if I can't do it?!!! I didn't produce anything though and left that night feeling uncertain. Maybe I shouldn't be taking the class after all. But I didn't give up. I went back for a second night (last night) determined to use the wheel come hell or high water! I kneaded up my three balls of clay, slipped on the sleeve to protect my bracelets (I was going to take them off before the class but let myself be persuaded to leave them on and try the sleeve...it would be alright) and sat down at the wheel. My mind went completely blank. I couldn't remember anything the teacher had told us the week before. My first failure! I had to force myself to stay at the wheel and not give up. Then Laura (relationship) came and sat next to me with her three balls of clay (she's used the wheel a lot so knew what to do). She guided me through the steps using a very different method from what the teacher had shown us the week before (creative diversity). With Laura's help I got going quite nicely. I was pleased with how things were going. My confidence began to soar. Yes! I'm a potter! No wait. It collapsed into a pile of goo. I'd failed. Again! But I had two more balls sitting in front of me and I couldn't let those go to waste so I picked up my second one and started again. The second AND third balls both collapsed. I was done. I may as well give up....I'll never get it right I told myself. I needed certainty. I needed confidence. I was ready to go home right then and there. But I kept repeating IFF over and over in my head. Intelligent Fast Failure. Keep at it and you will succeed. I cut and kneaded out three more balls, marched back over to the wheel and tried again (tenacity). 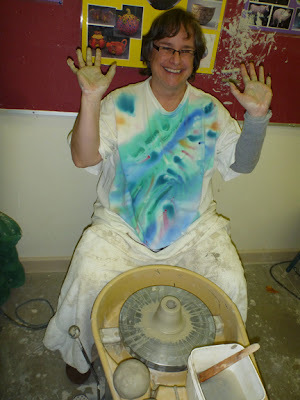 By this time the sleeve was soaked and my bracelets were completely covered in clay so I had to stop and take them off. I KNEW I should have trusted my instincts and taken them off before I even left the house (ownership). (Not really sure this has any relevance to being creative but it stuck out in my mind as a piece of the whole experience and serves as a reminder to me to trust my instincts more). With my fourth and fifth ball of clay I got nowhere except for lots of clay all over the place and big globs of gooey clay that I couldn't use anymore. Then along came the 6th. I slowed myself down. took a deep breath and centered that sucker on the wheel so perfectly it would make you cry! The next step worked and then the next. With a little tweak in technique from Laura I slowed down the wheel and kept working at it. Slowly slowly something started to form! I was elated. 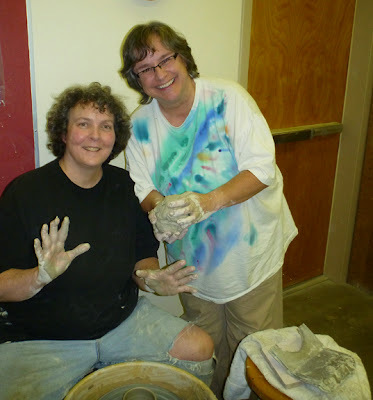 By the end of the night I had failed with seven balls of clay but produced TWO pots! They weren't the best and I recognize that I have to throw hundreds more to become really good at it but I learned so much more than just how to work a potters wheel. I think IFF has had the most impact on me during this course. Centre and Creative diversity are things I've intuitively known throughout my life but learning to fail and use each failure as a good thing (as opposed to the bad I've always thought it was) has had a profound effect on my life. It's ok, in fact good and necessary, to fail. As long as I learn from it and keep trying until I succeed.